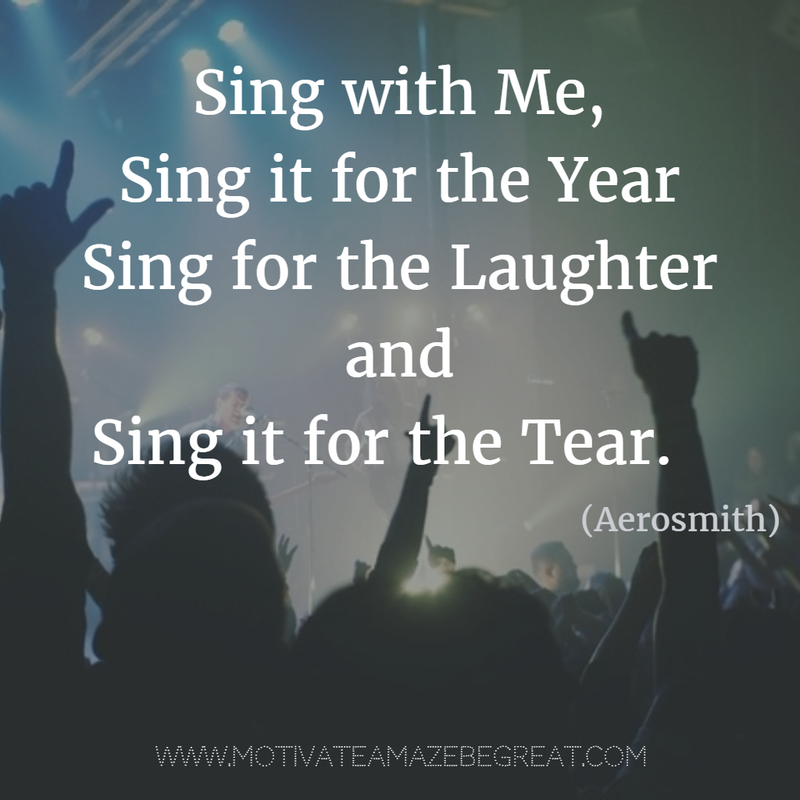 21 Most Inspirational Song Lines and Lyrics Ever - Motivate Amaze Be GREAT: The Motivation and Inspiration for Self-Improvement you need! 2. Inspirational quotes are also an excellent form of getting the inspiration you need. Now imagine if you can put the two together. Well you don't have to, because that's what great musicians already did for you: combining the right melody with the right lines/lyrics, and bang! There you have it, the explosive combo of music and words for the ultimate inspiration. We don't really know why, but there are those timeless lines from songs that stick in our heads for a lifetime. Some of those songs are funny or just dumb and that's ok, we also need them in life! But inspirational songs really are deep and we can relate to them cause they bring us back great memories, or, they simply inspire us to live our daily life with a smile on our face and move on stronger. 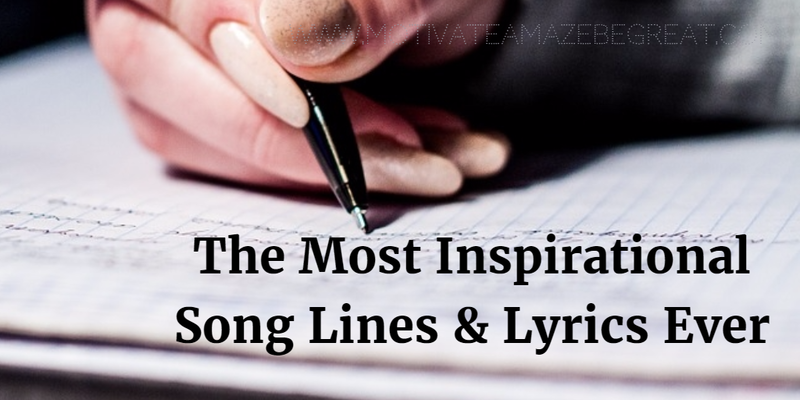 With those things in mind we've selected 21 of the most inspirational song lines ever in our opinion for you to get inspired. We've added the feelings we get from this song lines and why they inspire us. Enjoy and tells us what is your favorite all time song line/lyric in the comment section. 1. "Every little thing gonna be alright!" 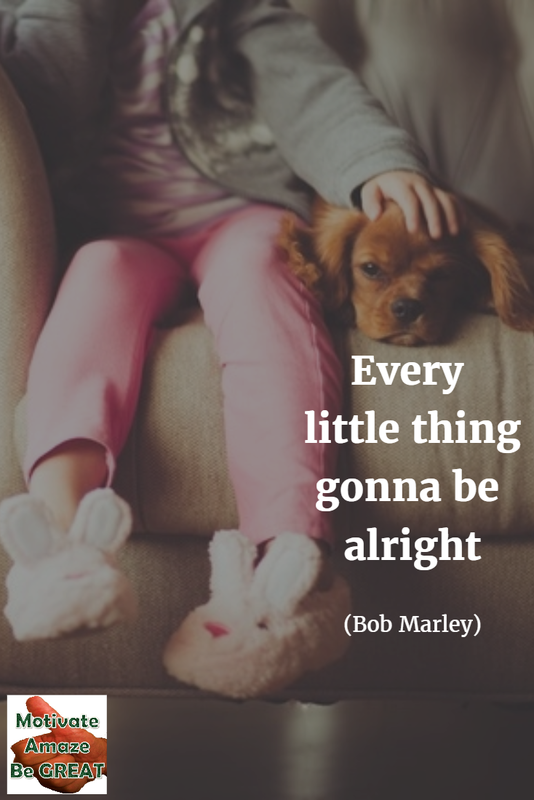 - Bob Marley and the Wailers "Three Little Birds"
Inspirational Song Line Meaning: Don't worry...we might add. This is so strong and really a great self talk quote. When you or your mates are going through insecurities and tough times, this is what you have to really say to yourself or them: Keep calm, don't worry, everything little thing is gonna be alright. 2. 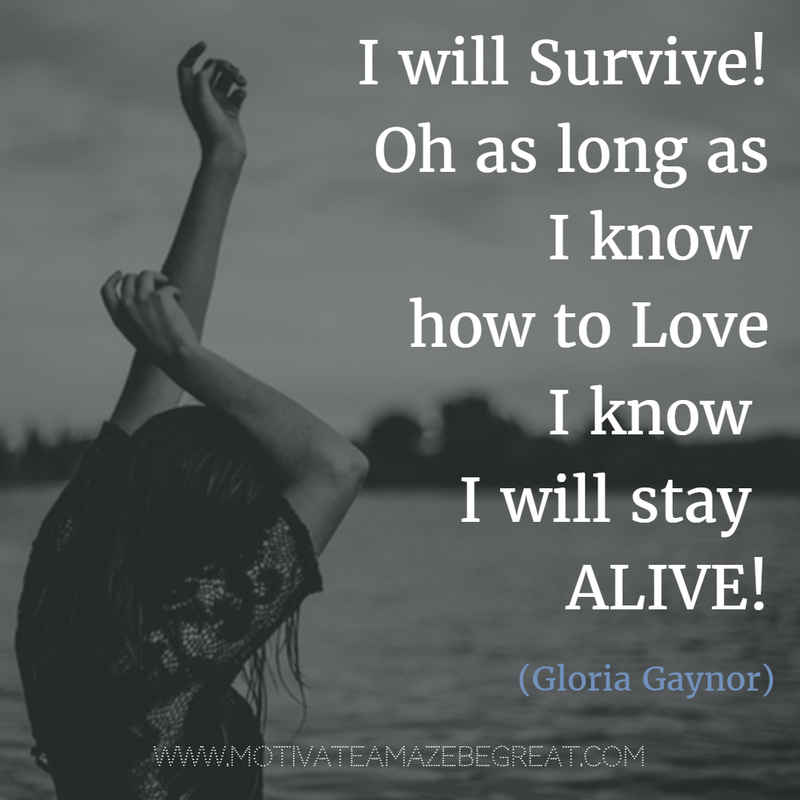 "I will survive! Oh as long as I know how to love I know I will stay alive!" 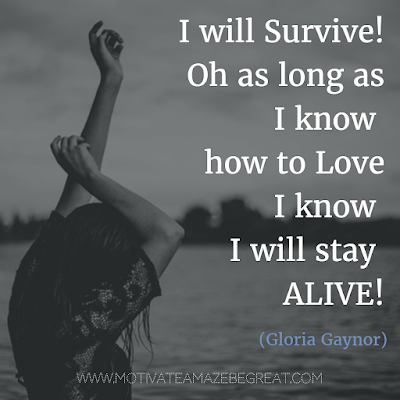 - Gloria Gaynor "I Will Survive"
Inspirational Song Line Meaning: Whatever your age is you probably heard these lines, because this song has been remixed many times throughout decades of music business, but the impact is almost the same! A great self talk quote and really a great mindset for life. Love is one of the strongest feelings human beings can rely on, even when there's nothing out there for them. Love yourself, love your life, love others, love your job, be happy with what you have. 3. 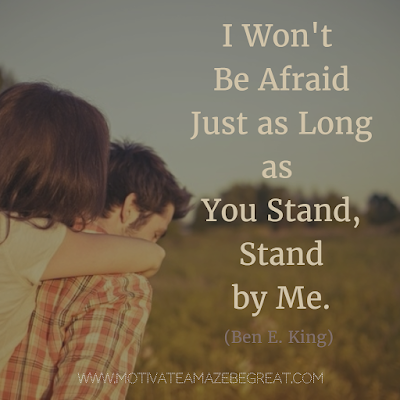 "I won't be afraid just as long as you stand, stand by me." - Ben E. King "Stand By Me"
Inspirational Song Line Meaning: Such a classic line from the old days! Sometimes all we need is the right partner on our side and we are capable of doing unbelievable things. Things that we wouldn't do by ourselves cause of fear. Remember no man is an island, you need to get your partnership working for a boost of courage in your life. Don't just do it for you, have a higher purpose, like the person that's next to you. I'm gonna work harder." 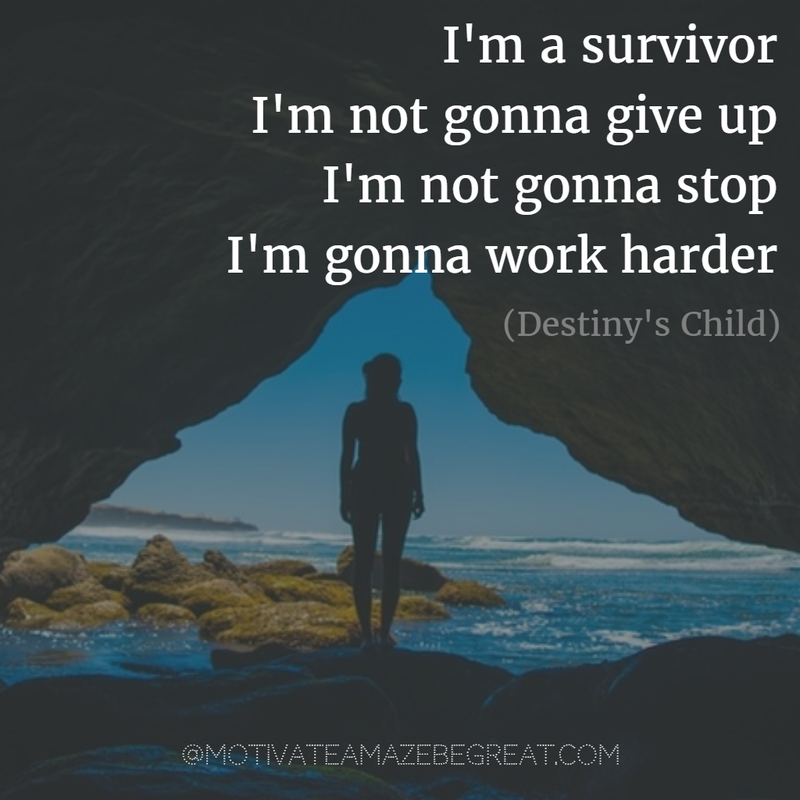 - Destiny's Child "Survivor"
Inspirational Song Line Meaning: Another great life guideline for encouragement and commitment. 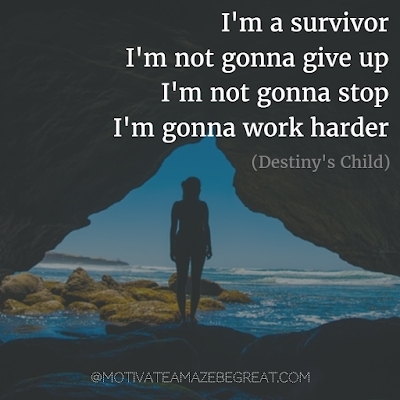 Back in the early 00s Destiny Child were surviving the music industry and these was the theme song for it. What a great inspiration for women and anyone who's willing to work hard to reach their goals. It's about having a strong mindset to survive chaos and never stop working for your dreams. 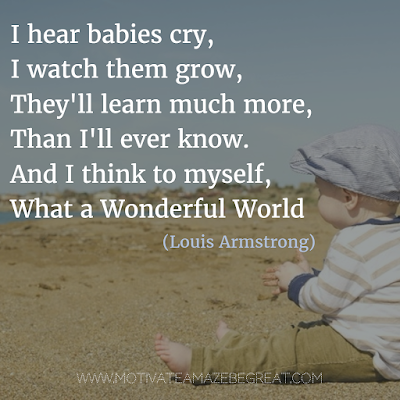 What a wonderful World" - Louis Armstrong "What a Wonderful World"
Inspirational Song Line Meaning: We go so fast through life that we forget to enjoy the little things. This what this song and the lines above are all about. 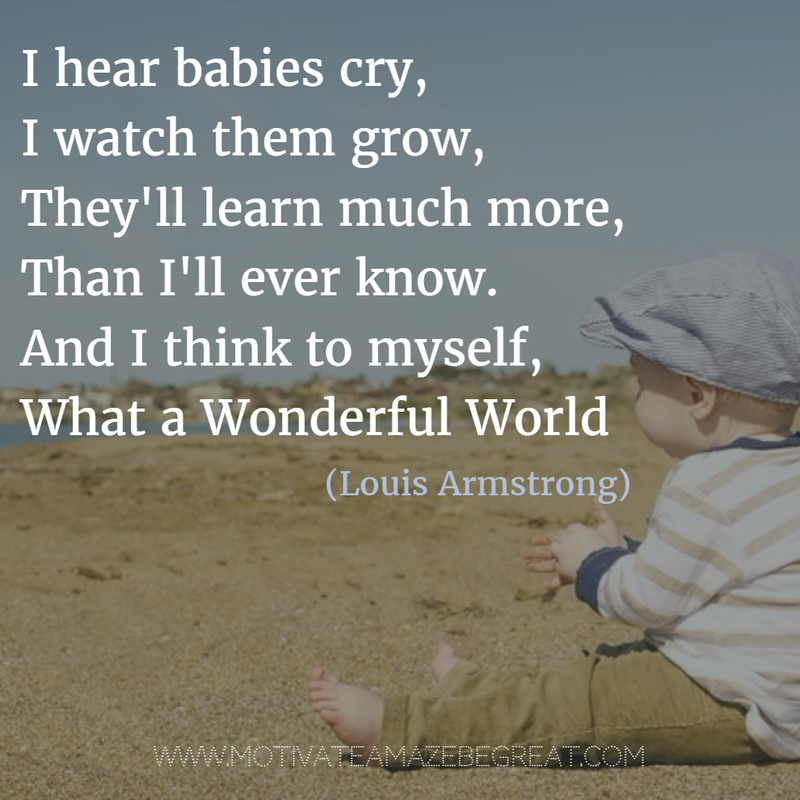 Follow Louis Armstrong advice and take time to enjoy life and understand how wonderful this world is. 6. 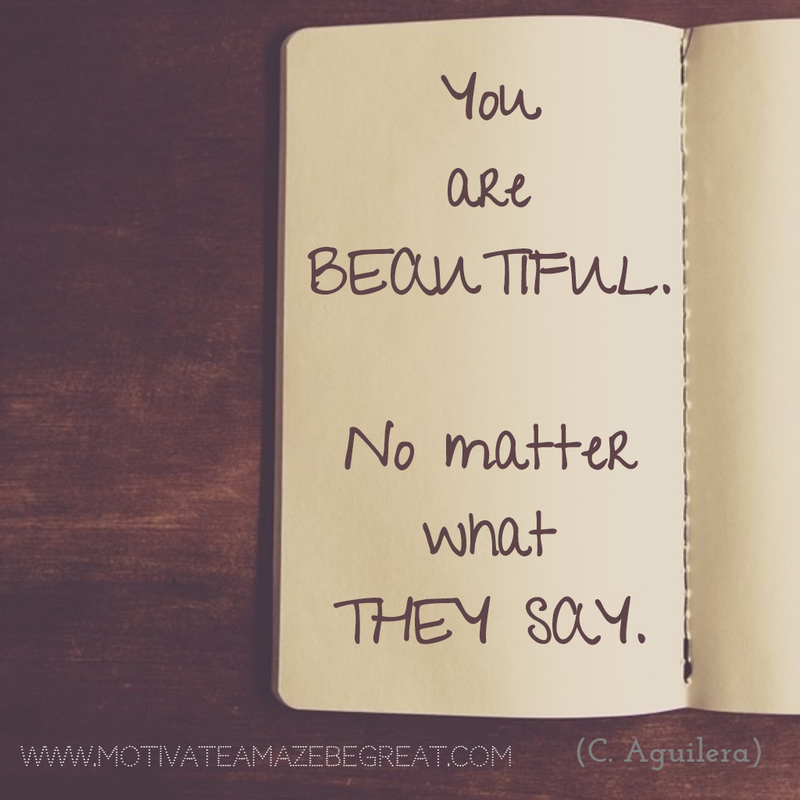 "You are Beautiful, no matter what they say." - Christina Aguilera "Beautiful"
Inspirational Song Line Meaning: This is a clear message for people who try to fit in what other people think is perfect. Don't listen to them, you are beautiful being who you are, of course you should strive to be the best you can be, but do it in your own way, not in the way society pressures you to be. You are beautiful in who you truly are. there ain’t no mountain high enough. To keep me from getting to you, baby." 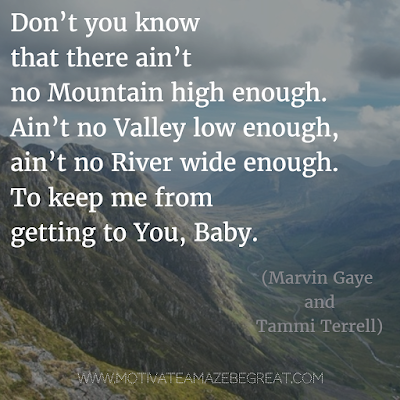 – Marvin Gaye & Tammi Terrell "Ain’t No Mountain High Enough"
Inspirational Song Line Meaning: Obstacles exist to be overcome. No matter the circumstances you should keep in mind your target, don't stop aiming at what you want. Things can get really hard, but quitting is not the way to achieve, only by continuing you can get there. Of course, this is a line from a love song, but you can adapt it to anything you love and deeply want in your life. and it's now or never! It's my life!" 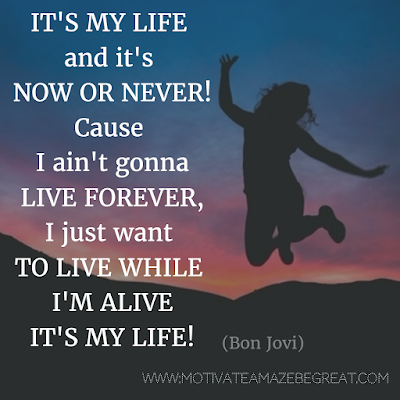 - Bon Jovi "It's My Life"
Inspirational Song Line Meaning: This is one of our favorites, teenage girls from the 90s really knew their stuff. Jokes aside, this is really powerful! Life it's not eternal, you have a limit on your time here, so you should strive to make the best you can with it. How many times did you felt really alive in your life? If you can count it with the fingers of one hand, it's now or never! Make a change, start to live a life were you feel proud to be alive. 9. 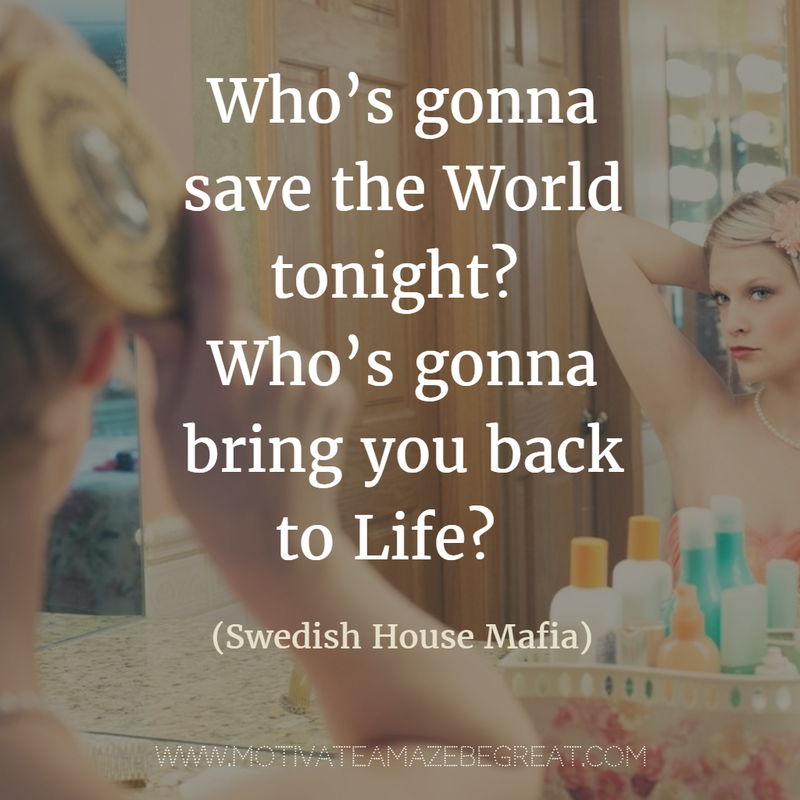 "Who’s gonna save the world tonight? Who’s gonna bring you back to life? "- Swedish House Mafia "Save the World"
Inspirational Song Line Meaning: This is a question you should make when looking at the mirror, and the answer is very simple: You! Take full responsibility for your life, you can become what you want, you can have what you want, but you must take the first step! 10. 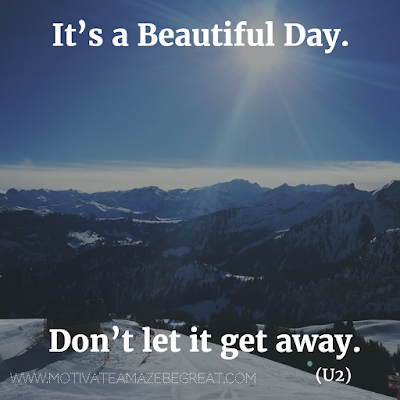 "It’s a beautiful day. Don’t let it get away." 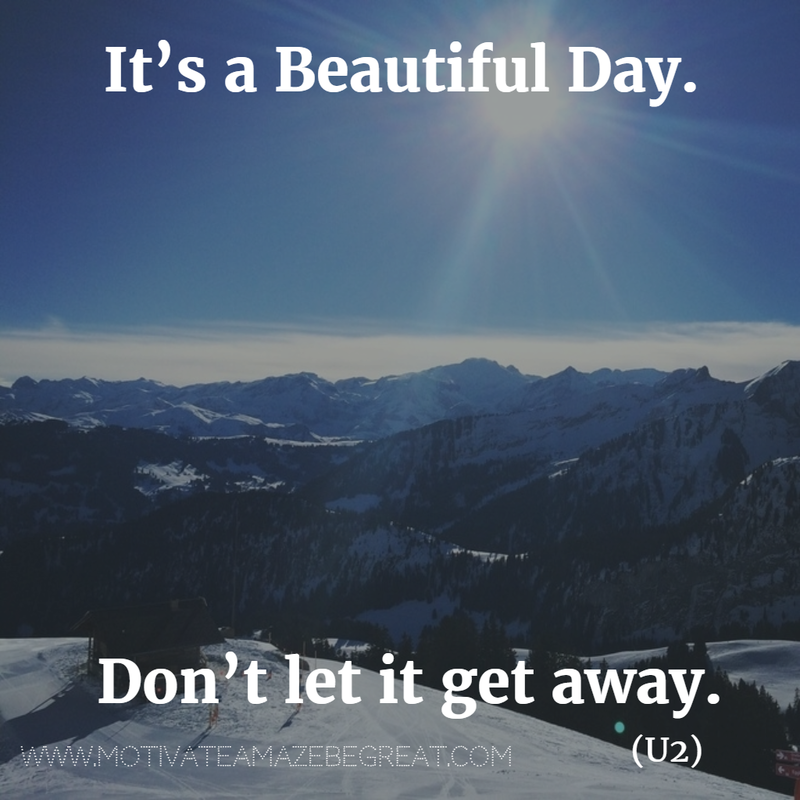 - U2 "Beautiful Day"
Inspirational Song Line Meaning: This U2 song celebrates life like few can. The rest of the song lyrics consist of examples of daily life setbacks, where the obvious feeling is to become frustrated with. But instead U2 gives you the ultimate motivational tip: despite all the problems you may have, you must step outside them an realize there is another day to be lived, use it to your advantage. Don't let negative situations break you, there is always a positive way of looking at things and overcome setbacks. First ten, last nine! 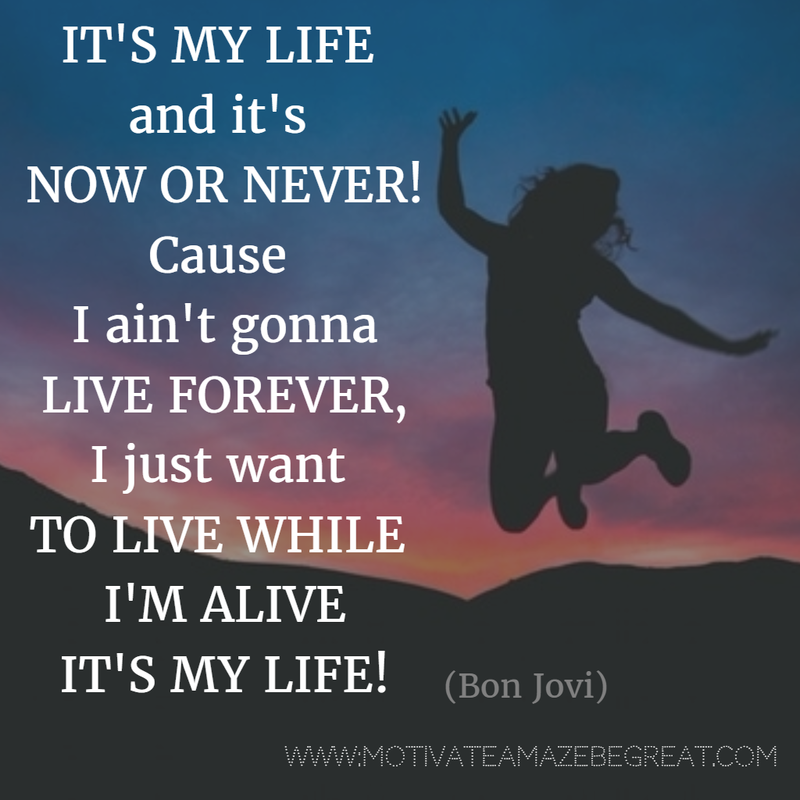 Have you seen your Favorite Inspirational Song Line or Lyric Ever? If you did great! If not... let's see if it made the last 9! 11. "Work it, make it, do it, makes us: harder, better, faster, stronger" - Daft Punk "Harder, Better, Faster"
Inspirational Song Line Meaning: Daft Punk 90s hit it's all about intensity. Push your limits so you can grow. The best example to understand this is physical exercise, when you workout consistently for a while you notice that your body adapts with time, and you become stronger, quicker, agile, more resistant, overall you become fit. This can be used in anything you do for living, by practicing you become better at what you do. So push it, work ethic and effort pays off big time. and sing it for the tear." 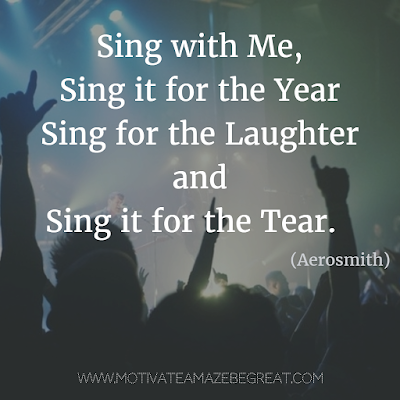 - Aerosmith "Dream On"
Inspirational Song Line Meaning: This is from the Aerosmith's firt hit, "Dream On" back in 1973. The lines featured here are from the chorus, but other fantastic lines are "You got to lose to know how to win". Whoa, that's huge! Again you must have a positive output in life, despite all the negative times. But negative and positive exist! So learn from your past negative experiences, don't let them knock you down and keep on singing, keep on living with a positive attitude. Embrace life with a smile, it will be easier to overcome obstacles. 13. "In every life we have some trouble. 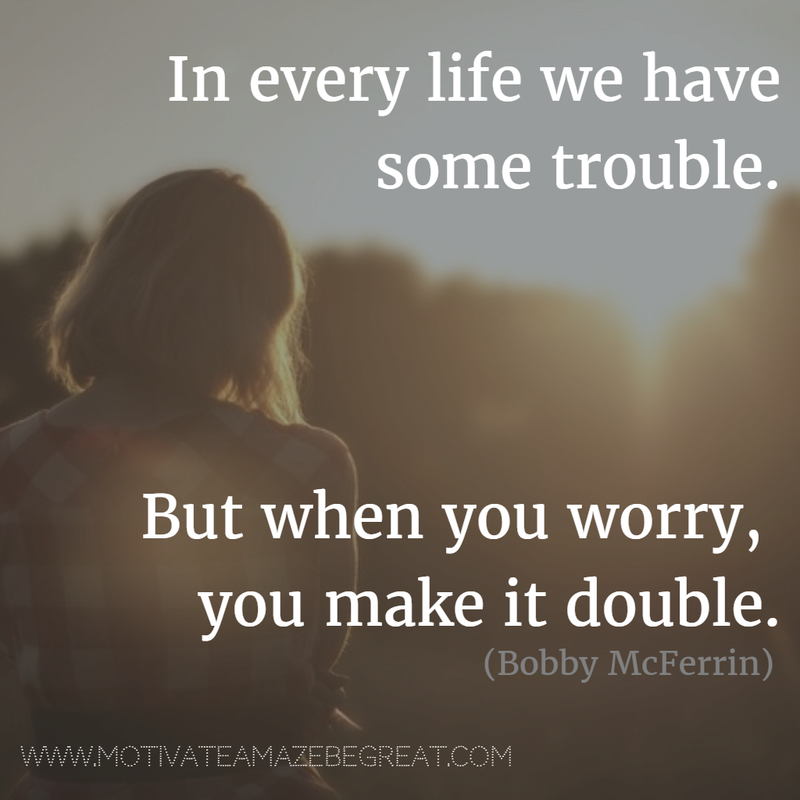 But when you worry, you make it double." 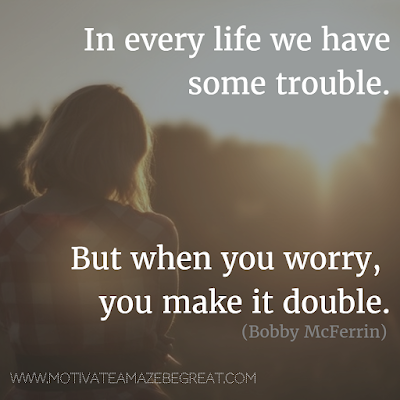 - Bobby McFerrin "Don’t Worry be Happy"
Inspirational Song Line Meaning: Just the hook/tittle of this song it's big, but we've selected a deeper line to inspire you. Troubles will come in your life, worrying about them doesn't erase them, it's quite the opposite, "you make it double", they become bigger problems. So, problems exist, you have them, I have them, we all have them, big deal?! All we have to do is to acknowledge them and find the solution for them, then move on. Don't get stuck. 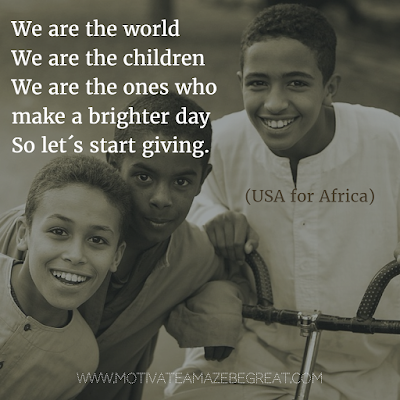 so let's start giving." 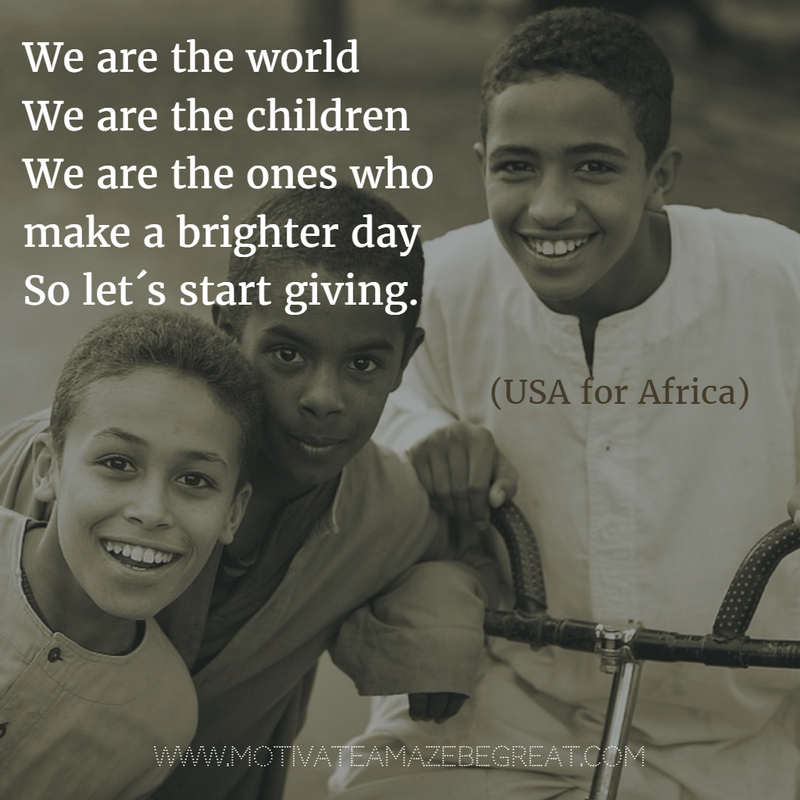 - United Support of Artists for Africa "We Are The World"
Inspirational Song Line Meaning: We know this is a cliche song, but it's indispensable in our list. Back in the 80s artists from all over united and stood up for starving people in Africa by recording this song, profits went straight to charity. This is an example of contribution for all of us, the lines featured here consist on making people aware that we are all the same, and it's up to all of us to make a difference. Don't become indifferent to mankind problems, because you are part of it, it's up to us to make a brighter day to those in need. 15. 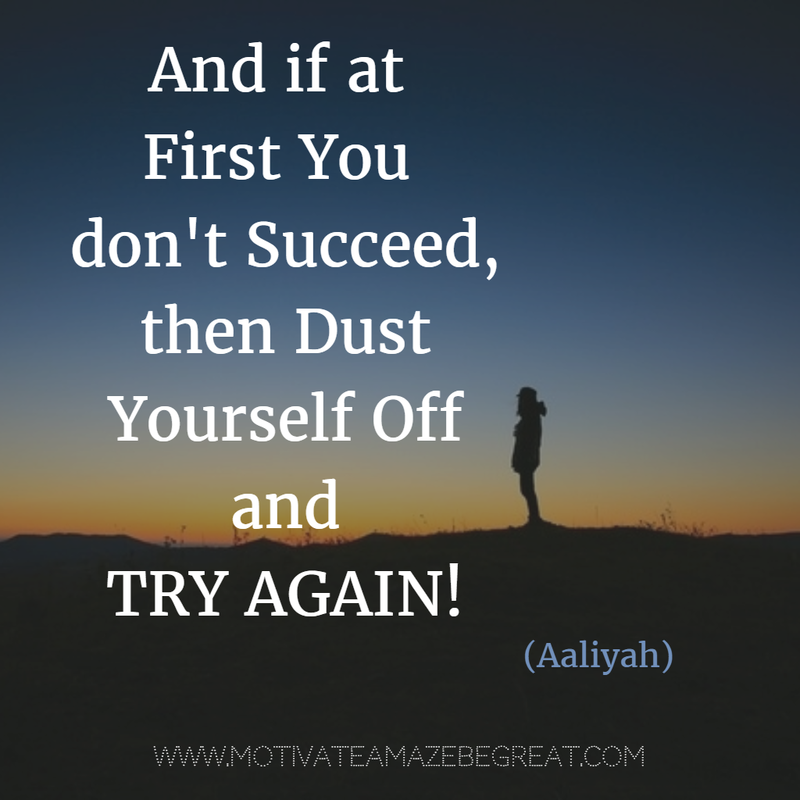 "And if at first your don't succeed, then dust yourself off and try again!" 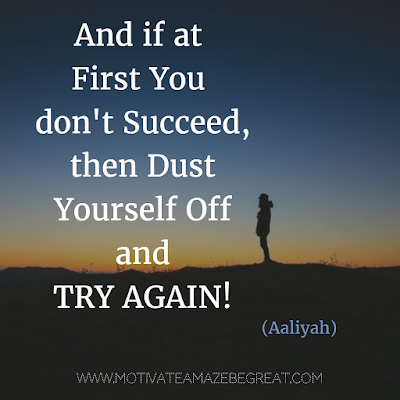 - Aaliyah "Try Again"
Inspirational Song Line Meaning: The late R&B singer Aaliyah, graced us with this gem in the early 00s before she left us. What a great motivational quote this is! Indeed deep, we were taught to be always right at school and if you failed you were no good... We took this concept to our adult life, conservatively, any time people fail they think they're no good. But that's not true, because the expert once was a beginner, so he had to fail time and time over, until he managed to get it right. So, you too can become an expert, as long as you don't quit. You'll fail at first, and probably more times, but keep on going, dust yourself off and try again wiser and stronger. what you give." 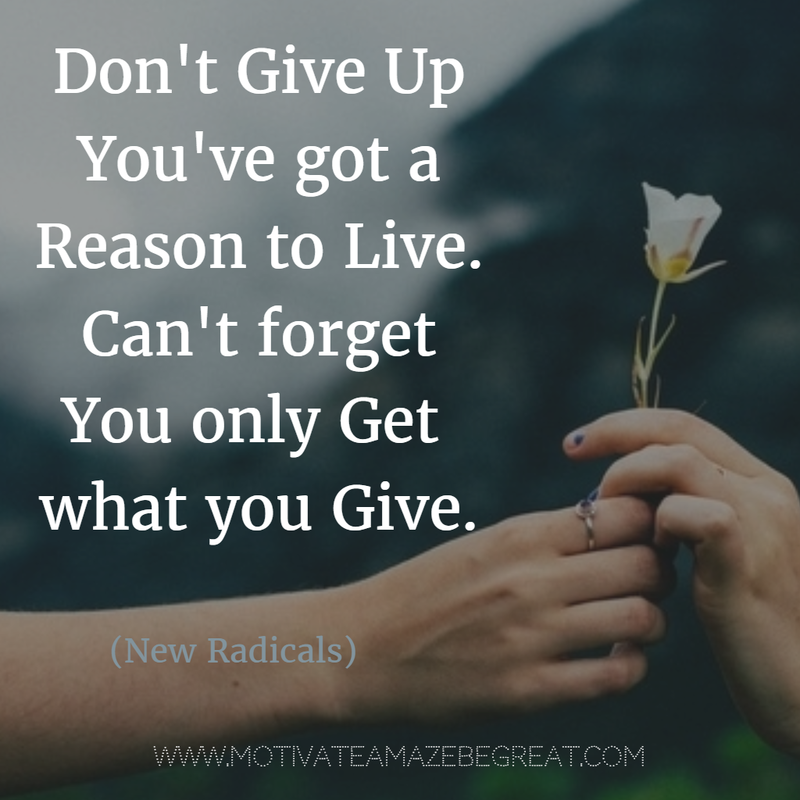 - New Radicals "You Get What You Give"
Inspirational Song Line Meaning: Remember this music video with all the kids going crazy at the mall? Yes! That's the way we want you to remember this lines, in a energetic and radical fashion. Your reasons for living must be stronger than your reasons for quitting, so you can move on and grow. Also, contribution must be your mission too, you get what you give, that's the whole truth. 17. 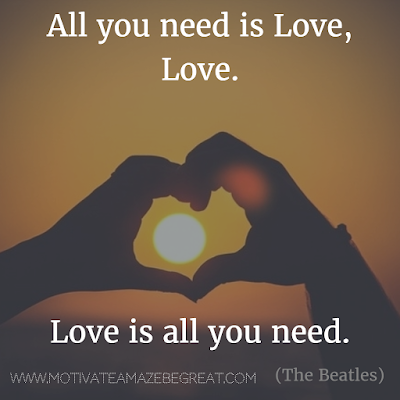 "All you need is love, love. Love is all your need." - The Beatles "All You Need is Love"
Inspirational Song Line Meaning: This is such a timeless classic, shame it became quite a cliche over time, but's it's so true. The first tool you need to achieve everything you want in life it's with you since birth! It's your capability to love and that's all you need. Love can get you through any problem you may find. Have a true passion for what you do, let love be your driving force and you'll be fine. 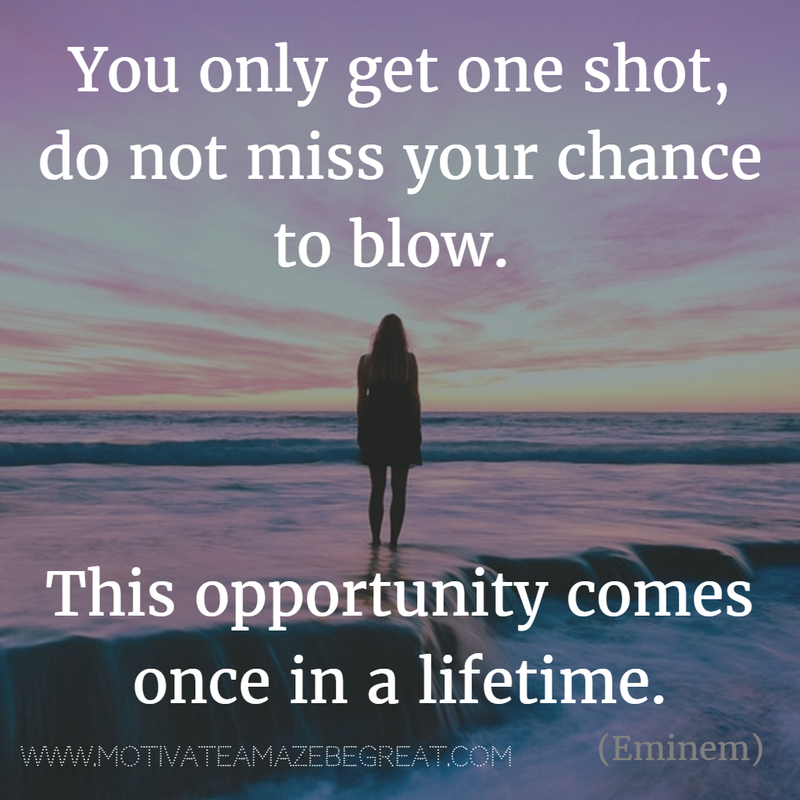 once in a lifetime" - Eminem "Lose Yourself"
Inspirational Song Line Meaning: All about opportunity. Opportunity comes to those who prepared for it, so be prepared. It's indispensable that when opportunity comes you take full advantage of it. This Eminem classic song, was part of the soundtrack of the movie "8 Mile", were a young rapper tries to make it in the music industry, where opportunities lack and few make it. It's the perfect workout song and theme for those who are trying to achieve their dreams. 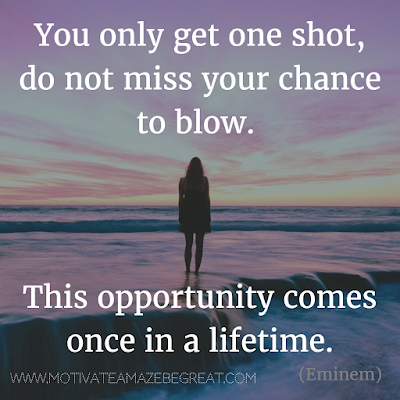 Do not miss your chance to blow! 19. "Went the distance, now I'm back on my feet. Just a man and his will to survive." 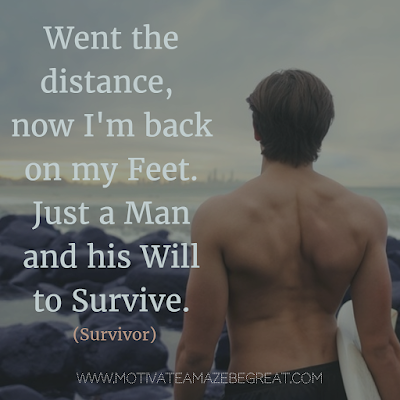 - Survivor "Eye of the Tiger"
Inspirational Song Line Meaning: Another huge classic from a timeless inspirational movie "Rocky III". Rocky is already an established fighter, famous and rich, but success defeated him. He doesn't have the "Eye of the Tiger" no more, the relentless desire that made him a champion in the boxing world back in the past is no where to be found. Fame and riches made him soft. Suddenly life hits him, and he loses his title. He feels the need to back to his roots and search for that desire. Well this is what you must constantly be looking for, the desire to achieve, despite all the success you might attain, life will not stop. Stay sharp and remember where you came from. 20. "Get up, stand up! 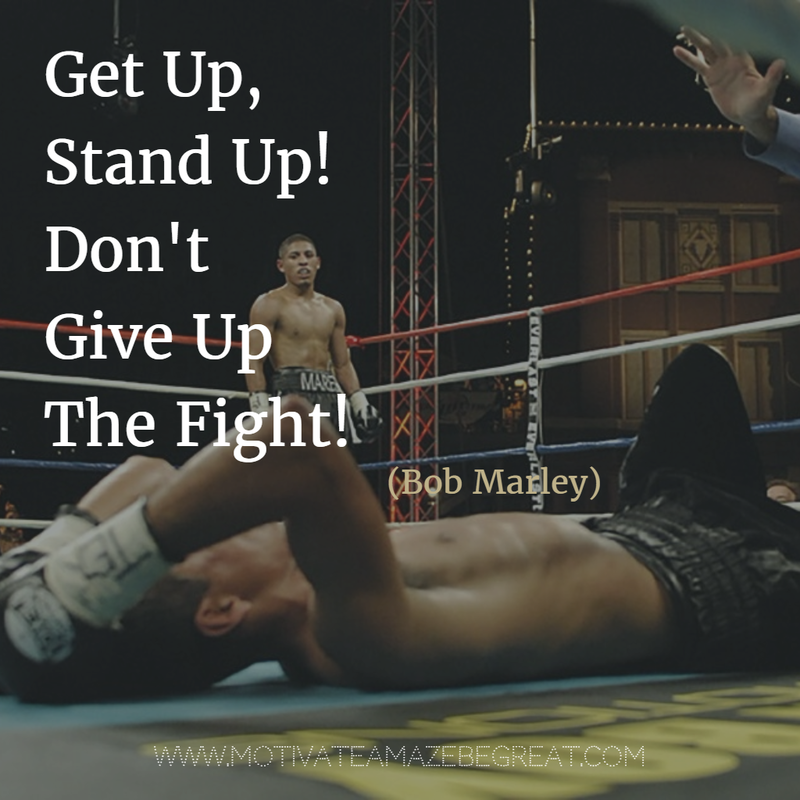 Don’t give up the fight!" 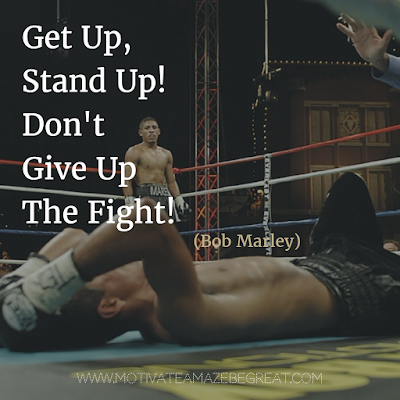 - Bob Marley "Get Up Stand Up"
Inspirational Song Line Meaning: Another great Bob Marley line, in the picture we give the example of a fighter who is knocked down while the referee is making the count to stop the fight, but this can be used to any fight or struggle you have in life. We already told you, life will knock you down, but you must get up and stand up. Quitting is not an option! Stand up for your rights, stand up for what you believe in. No fight is over in your life until you say it's over, keep going! 21. "You may say I'm a dreamer. But I'm not the only one." 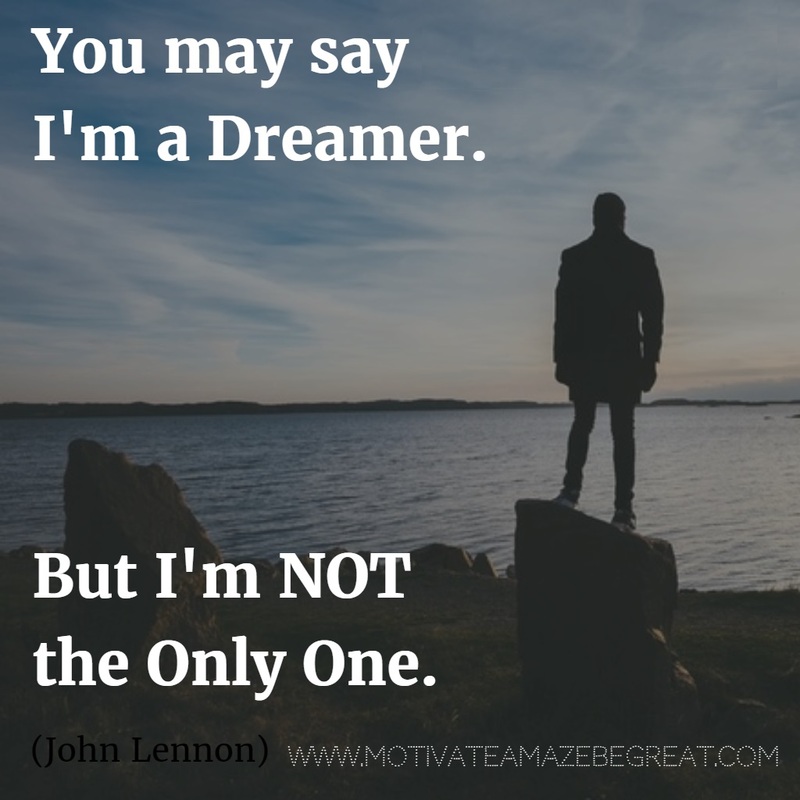 - John Lennon "Imagine"
Inspirational Song Line Meaning: Well, this whole song it's inspirational, but we picked this line for a reason: Dream killers are everywhere, you must protect your dream from them, because they will try to bring you down and they will be successful, if you allow it that is. 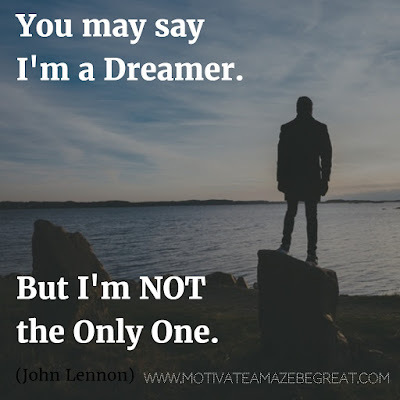 You have a dream, I have a dream, we all have a dream, the beauty of it is that we can unite to achieve our dreams, because some of them are similar. So, share your dream to the world, because you might find people that have the same dream as you do, and achieving them is closer to become a reality! Is your song in our checklist of the most inspirational song lines and lyrics ever? We would love to hear what's your favorite and your suggestions to increase this list in the comments section bellow.